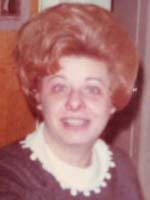 ALBANY – Madeline L. Mendel Rosenthal, 84, passed away on Monday, September 12, 2016 at the Teresian House. Madeline was born in Albany, and lived in Albany and Colonie most of her life. She was a graduate of Vincentian Institute in Albany, and was a longtime communicant of Blessed Sacrament Church in Albany, and Christ Our Light Church in Colonie. Madeline was a talented singer and sang on Teenage Barn on WRGB in the early 1950’s. Madeline was predeceased by her husband Larry Rosenthal. She is survived by her brothers Herman Mendel (Patricia Stratton) of Troy, and Charles Mendel (Annie) of Albany; and by many nieces and nephews, and great nieces and nephews. She was predeceased by her siblings Sr. Dorothy Mendel, RSM, Margaret (Jackie) Stafford, Constance Curry, and Eugene Mendel. Calling hours will be held in the Hans Funeral Home, 1088 Western Ave., Albany, Sunday, September 25th from 10:00 am to 12:00 noon. Relatives and friends are invited. Madeline will also be remembered at a mass in the Infant of Prague Chapel at the Teresian House, 200 Washington Ave. Ext. on Saturday, November 12th at the 10:00 am mass. In lieu of flowers, memorial contributions may be made to the Teresian House, 200 Washington Ave. Ext., Albany, NY 12203. To leave a message of condolence for the family or obtain directions to the funeral home, please visit www.HansFuneralHome.com.